Strategy Development – Many businesses struggle to manage their product’s lifecycle, from ideation through maintenance of products. Additionally, the trend of customization and low-volume production increases the cost of operations. We provide organizational analyses to help executives adapt their businesses to proactively address these trends. 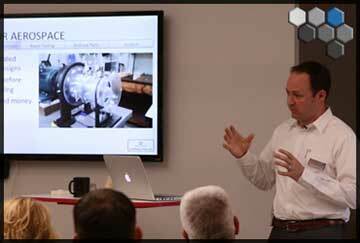 Technology Briefing – Technology changes quickly, few technologies change as quickly as additive manufacturing. We stay on top of the latest developments and can provide candid, honest assessments of the best applications for additive manufacturing technologies of all types. We’ll bring you up to speed and point you toward where the future lies. Product Viability Assessment – Considering changing a product to additive production? With our consulting services we can take a deep dive into your product portfolio, identifying which components are viable candidates for 3D printing. Make/Buy Analysis – There are a lot of methods to obtain 3D printed parts. Integrating the technology can be capital intensive. We can perform objective make/buy analysis to help you determine whether you should integrate a production cell, or outsource the production of 3D printed parts. Including ROI, machine and material estimates and facility requirements. Technology Readiness Assessment – The adoption of additive manufacturing in operations creates a shift in resources for production. This often includes shifting resources from supply chain management and production plants to engineering and production planning roles. Should you adopt Additive Manufacturing in a quick, disruptive manner, or take a more measured approach? We assess the readiness of your company and advise on the best tactic for integrating this technology. Site Assessments – A properly setup additive manufacturing cell incorporates lean production principles in a safe, ergonomic environment. Facility requirements can vary greatly dependent upon the scale of operations and machine type or material that is being used. We advise on new or existing installations for best in class workflows. Design for Additive Manufacturing – While an amazingly flexible technology, additive manufacturing has design constraints that once understood, can unlock tremendous productivity improvements; making products more effective and adding value through previously unachievable designs. We train engineers and designers on techniques to benefit from additive manufacturing. Speaking Engagements – The topic of 3D printing fills seats at annual meetings and technical conventions worldwide. We are eager to share innovations, trends and insights about additive manufacturing in specific industries and their impacts on business.